Barbershop Harmony is a four-part "a cappella" style of vocal music that is based on the art form known as "American Popular Song" and performed by gender-specific quartets and choruses. The melody is almost always sandwiched between harmonies, and the style can be recognized by its reliance on mostly consonant chords and dominant seventh chords, as well as solid chord-inversions and musically interesting chord-progressions. Because it is performed without instrumental accompaniment, Barbershop Harmony can be tuned by the singers according to the "true scale." When the tuning, balance and a given word sound are properly executed, certain harmonics associated with the notes being sung are enhanced, while others are diminished, resulting in a fifth note that is audible two octaves or more above the four notes being sung. This phenomenon is known as an "overtone," and it is a vital ingredient of Barbershop Harmony when performed well. 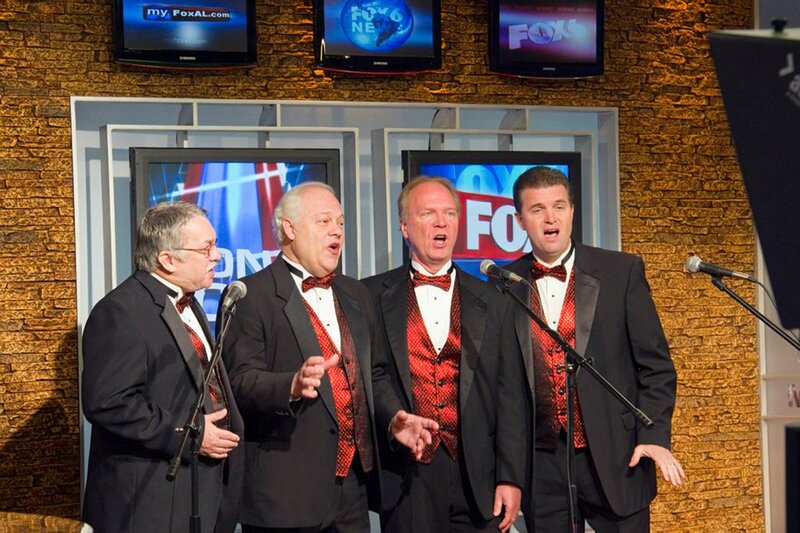 There are other facets of barbershop harmony that are frequently used, but not always present in every performance. Frequent modulations (key-changes) within a song are facilitated by the true scale and the singers' ability to immediately "tune" their vocal instruments. "Bell-chords" are sometimes used to illustrate the four voice-parts, sometimes while also "painting" a word or phrase. Sliding during an interval (from one note to another) is a vocal technique that adds contrast and style. While stereotypical elements of barbershop groups such as striped vests, handlebar moustaches, and straw hats remain; in reality, American Popular Songs are now performed by thousands of contemporary male and female barbershop ensembles comprised of singers who exhibit a wide range of racial, religious, and ethnic diversity, not only in the USA but in a dozen other countries throughout the world.